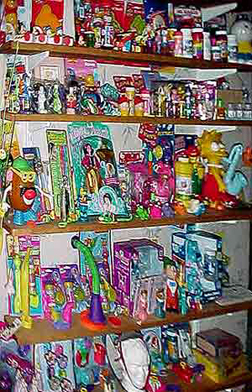 Around 1997, I grew tired of my two long-time collections of pink Depression glass and Santa Claus figures and I was looking for something new to collect that would be fun. Collecting bubble blowers seemed like a good idea at the time. I assumed there weren't a whole lot of bubble blowers and that I would be able to have a pretty complete collection of at least the contemporary ones. Was I ever wrong! The more I bought, the more I discovered I didn't own. Finally, hundreds of bubble blowers later, I decided I should try to focus on one kind of bubble blowers. So, I now try (not terribly successfully) to limit my purchases to "character" blowers -- the more colorful, contemporary, and recognizable ones that look like people, animals, cartoon characters, and so forth. I know of some collectors of vintage bubble blowers, but think I may be the only one collecting more contemporary items. 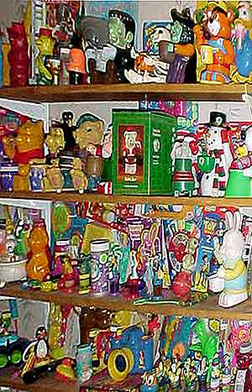 Even if not the only one, my 600+ bubble items are likely to make up one of the largest collections and this collection continues to grow at a ridiculously high rate. 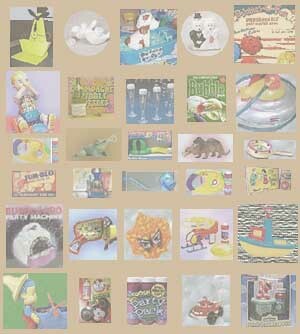 In addition to items from my current collection, I have included in this database many, many bubble blowers I have seen, either in person or on the web. I'm adding pictures and information as fast as I can -- I have years' worth that I've filed. I hope someday to use this database to write a book for all the potential bubble blower collectors out there. Bubble blowers make a great collection. Children can pick up colorful wands at garage sales for next to nothing, and can watch for bubble pens given out for advertising. Adults might want to focus on vintage sets, television characters, old tin battery-operated bubble makers, mechanical ones, or on bubble blowers made by one of the many made by the large bubble blower companies of FunRise, Dorda, Tootsietoy, Imperial Toy, and Fisher-Price. If you are a collector, please email me.